What did we do before Pinterest!? In all seriousness! Thankfully I have not had to buy a single Bride magazine, instead I just have a slightly obsessive bridal Pinterest board. 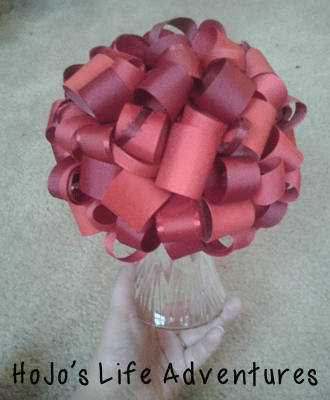 Anyway, I came across this tutorial to make ribbon pomanders and I knew that was what we needed for the wedding! Here’s how it all worked out. 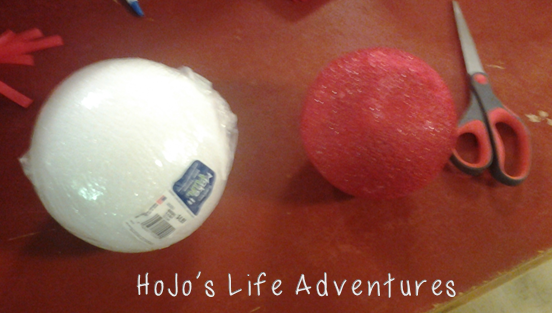 I realized quickly that a white styrofoam ball did not work as well with the red ribbon. It was easy to tell when I made a small mistake by not thoroughly covering the ball, so I simply spray painted them. Cutting the ribbon probably took the longest. I got lucky and have a friend who owns a craft shop. She let me buy the ribbon at cost! (Even though I did give her an additional 10% against her wishes.) 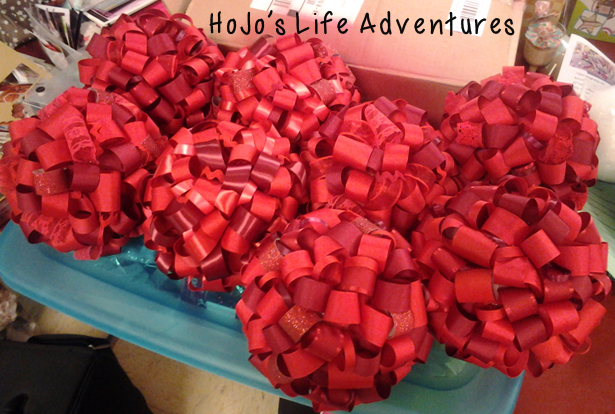 Each styrofoam ball needs about 150 four inch pieces of ribbon. Trust me, your fingers will be sore when you get it all cut! 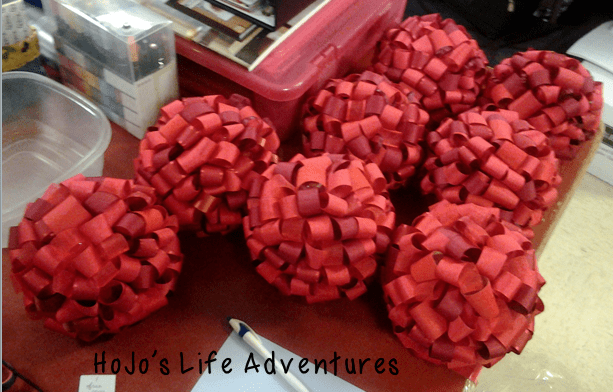 So you’ve got the spray painted styrofoam balls, all the four inch pieces of ribbon you need (varying from 1/2 inch to 1.5 inches in width), and plenty of stick pins! Now you just start putting them into place! They don’t look great to start with! There’s really no rhyme or reason where you put the ribbon. Just get it to fill in and try not to put the same piece/style of ribbon together too much. This is one of the more plain looking pieces. 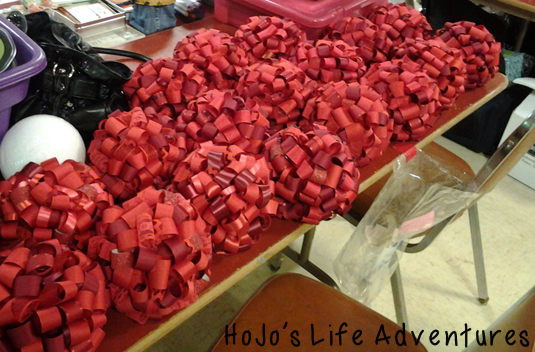 I had bulk ribbon in two different shades of red, and in several sizes. However, I also hit thrift stores and family and friends’ ribbon supply to get some fun/funky ribbons. You can see some of these different ribbons in the pictures below. Definitely get as much of the “fun” ribbon as you can! 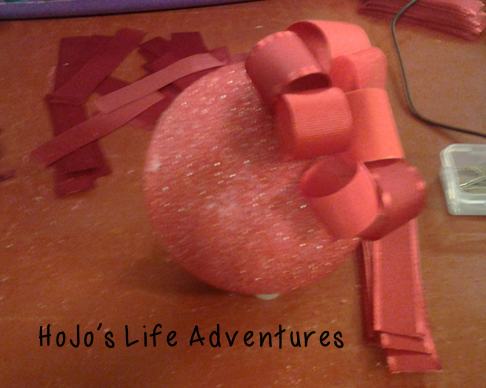 I was running out by the end, and those ribbon pomanders are my least favorite. They still work, but they’re not as unique. 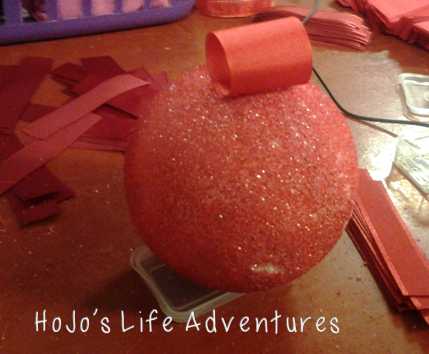 The first ribbon pomander I made took me about an hour and half. By the end, I was doing them in about 40 minutes. 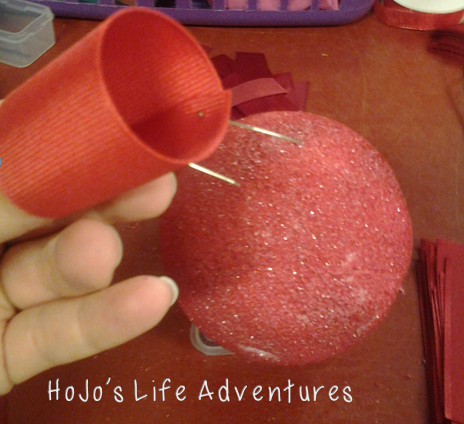 I did all but the bottom, and then I glued on the sherbet cups I found with hot glue. 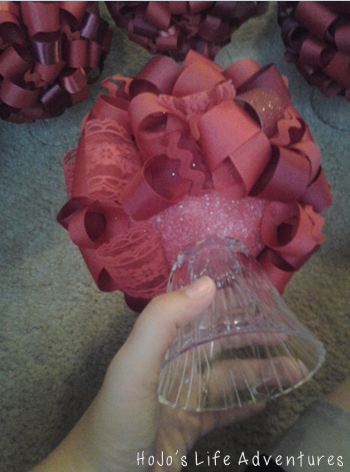 Finally, I had to stick pin a few more pieces of ribbon into the bottom to make sure it was all covered. Here’s the finished product again. Yes, I know it’s the same picture as before but I love them so much I just had to show it off again! Update: We now use several of these as decorations in our home. They are a great remembrance of our special day! Questions? Ask below and I’ll do my best to answer them for you. Those are so cute! My daughter would love to make these! Really beautiful. Perfect for weddings! Very cute idea and inexpensive. You could use these on any number of decorating occasions. Very nice! I like the ones with the mix-match ribbons best. Thanks for linking up this idea to the Virtual Fridge!